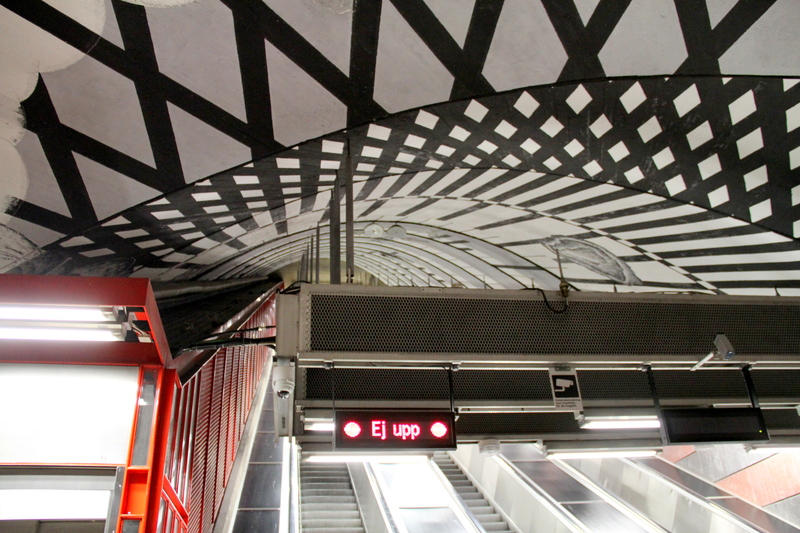 Stockholm has one of the most spectacular subway systems in the world, the T-Bana, which is quite saying something when you consider the marble palaces of Moscow and St. Petersburg, the concrete cathedrals of Washington, and the archaeological ruins of Athens and Mexico City. The system is billed as the longest art gallery in the world, which, in a certain respect, is hardly unique. Subways have long been a means by which to bring art to the masses: the classic Soviet systems, Montreal, Los Angeles, Munich. 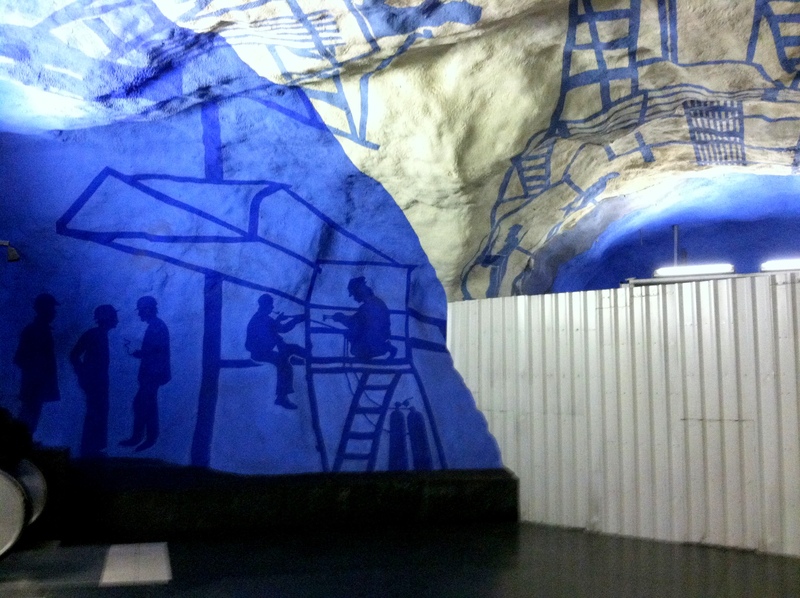 But certain stations in Stockholm, primarily along the city’s Blue Line, are singularly spectacular due to the city’s geology. 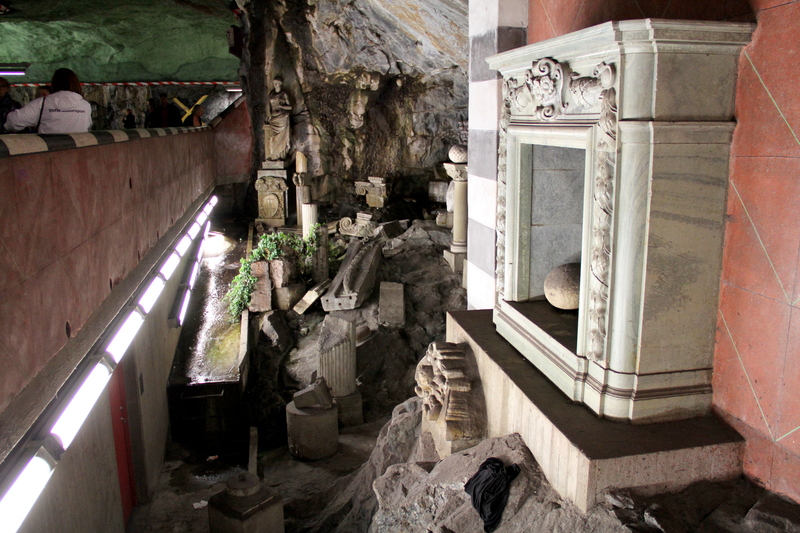 Due to characteristics of the bedrock beneath the watery city, instead of boring, the metro’s stations and tunnels are simply blasted away – oddly fitting in the birthplace of Alfred Nobel. As a result, the system’s stations are grand cavernous spaces not wholly unlike certain Washington stations in scale, but, with the bedrock left exposed, they feature an eerie, cave-like atmosphere. 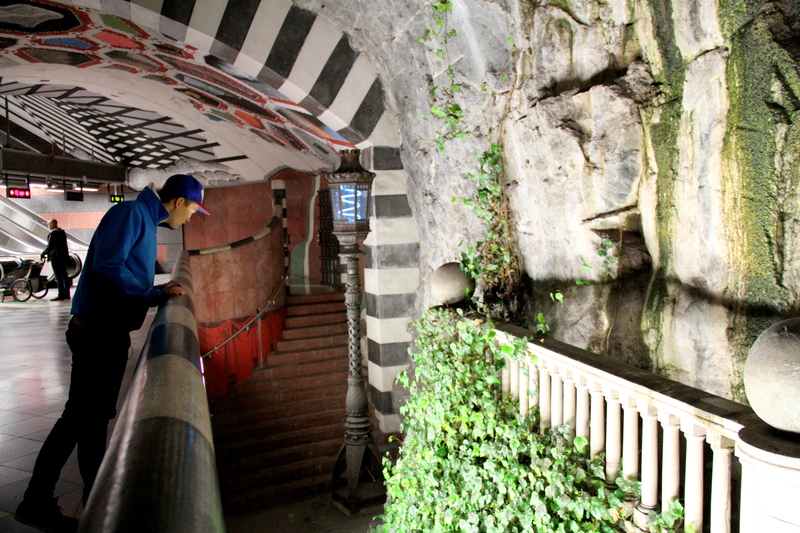 In many of these spaces, artists’ imaginations have been let loose on the cave walls. 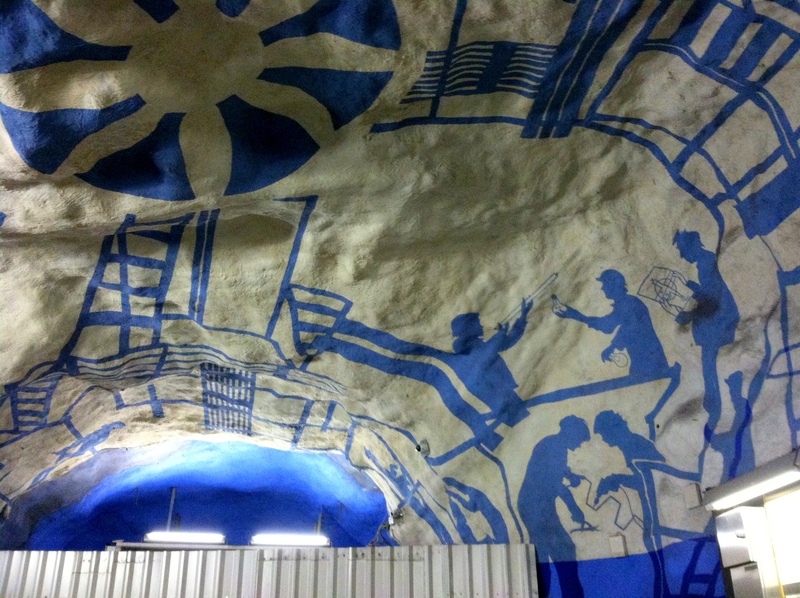 On a recent visit, I spent time exploring three of Stockholm’s most jaw-dropping subterranean galleries: T-Centralen, Kungsträdgården, and Solna Centrum. As the name implies, T-Centralen is the metro’s central station, located directly under downtown, where the system’s three lines meet. The older station, servicing the Red and Green lines, is rather utilitarian. 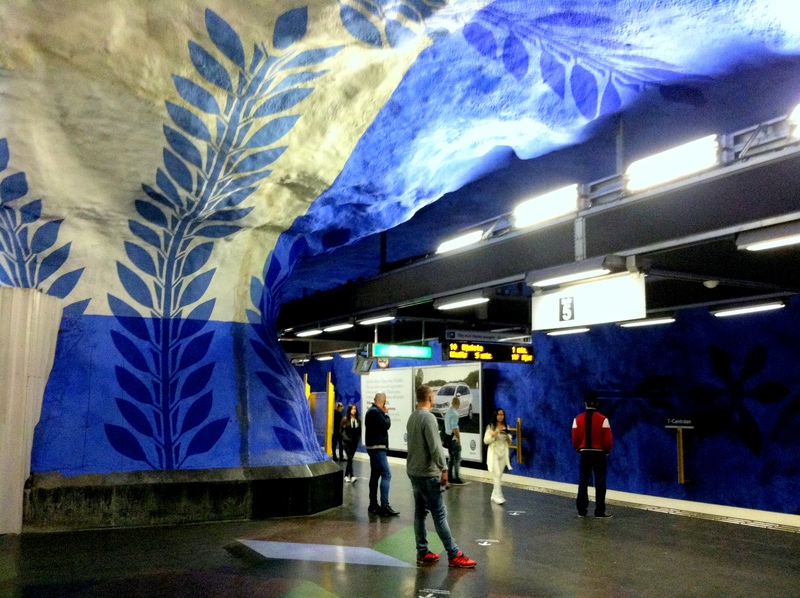 But the connected Blue Line platforms form an extraordinary cavern covered in abstract patterns in bright blue and white designed by Swedish artist Per Olov Ultveldt in 1975. At the end of the Blue Line, below a popular park of the same name, Kungsträdgården takes a different tack, giving the sense of a Roman archaeological dig. Water drips down the walls behind statuary. Walking across a bridge near one entrance to the station, you look down into an overgrown garden of columns and fallen finials – many of them taken from older buildings torn down during the mid-twentieth century redevelopment of central Stockholm. 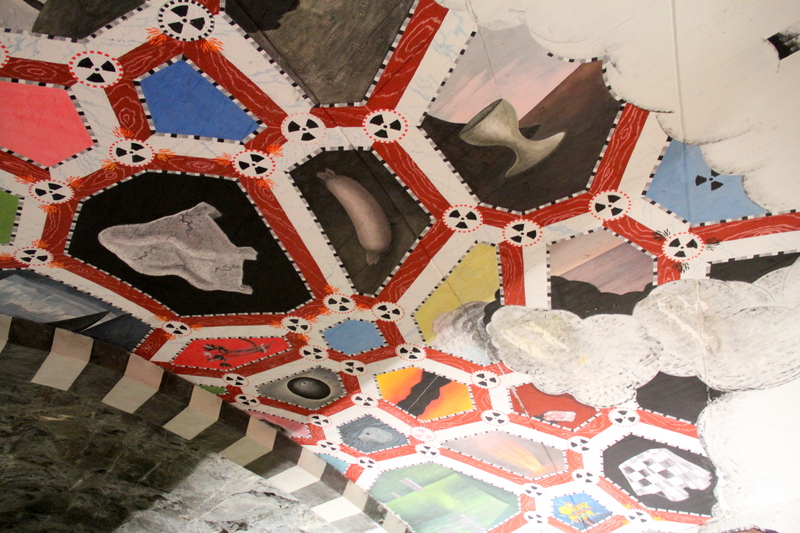 The bedrock walls are left mostly exposed, hidden only by bold murals in red and green and black and white. 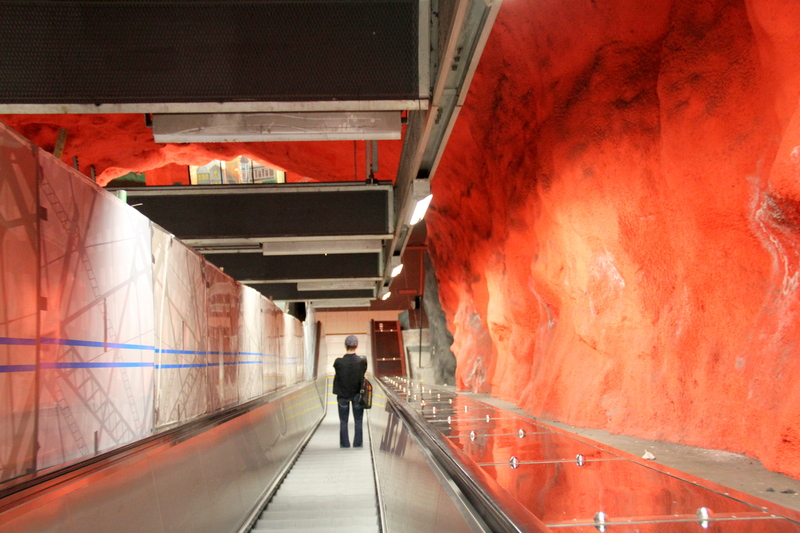 Where T-Centralen is a cool blue and Kungsträdgården is the steely gray of bedrock, Solna Centrum, farther outside the city center, is blindingly red. As seen in green and black murals along the track’s edge, Solna Centrum is meant to evoke the country’s spruce forests and the towns that harvested their lumber. Stockholm: One of my most memorable cities visited. Here was I, a sophisticate from New York traveling abroad for the first time and acting like a gawky tourist once I went underground. 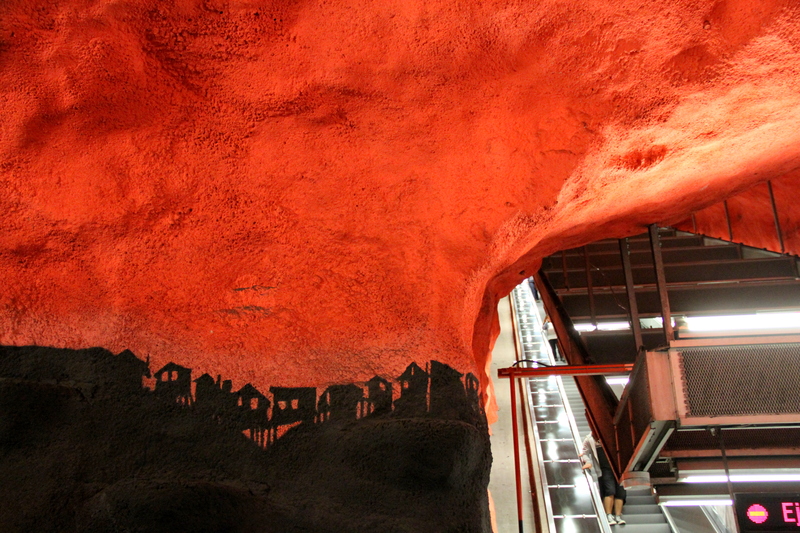 The subways of Stockholm truly are beautiful. Thanks for sharing this with. Stockholm: A city that I would love to visit! 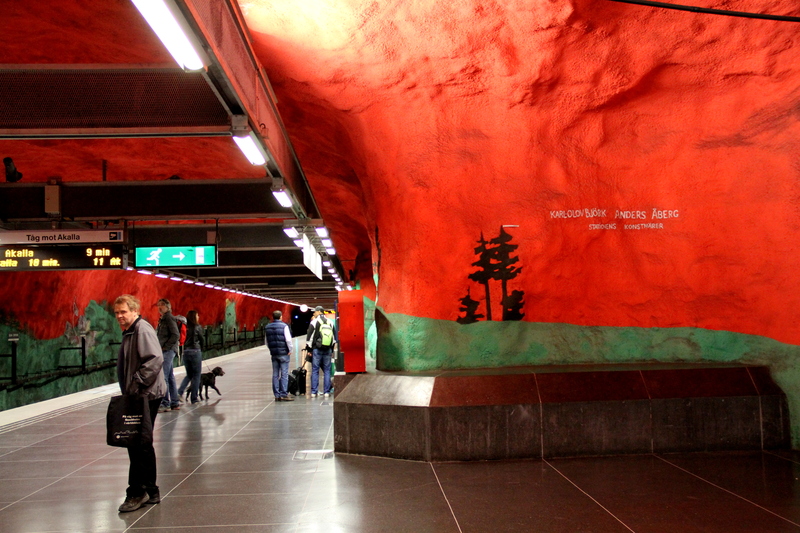 my daughter has just come back from Stockholm after three years, she did not tell me how beautiful the stations there are.